The boat is a Nimbus 26, which my father bought new in 1974 and it's been in the family ever since. Most of the time I've been in charge of the maintenance. 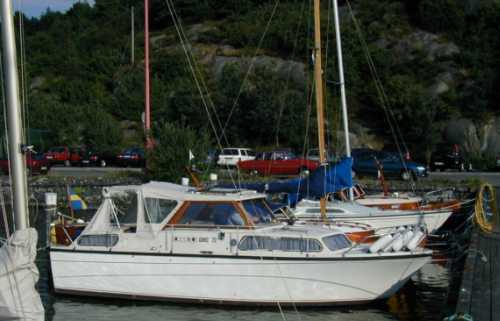 When my father died in 1996 I inherited the boat, that is 7.8 m long and 2.85 m wide. It has a fore cabin and an aft cabin, with two berths in each. Nevertheless we have been able to sleep four adults and two kids in the boat for several holiday weeks. It's powered by a Volvo Penta TAMD 31 diesel-engine (new in 2002/2003), and the normal cruising speed during holidays is 10 to 11 knots. Most summers since 1975 my parents, I, my wife and our two children have spent on this boat. We have made some longer trips to Germany, Denmark, Norway and around Sweden. And in 1998 we made a three month trip on the canals of Poland, Germany and The Netherlands to celebrate my 50th birthday. But of course, most summers, we have spent on the beautiful Swedish west coast.